Escape The Unopened Letter! 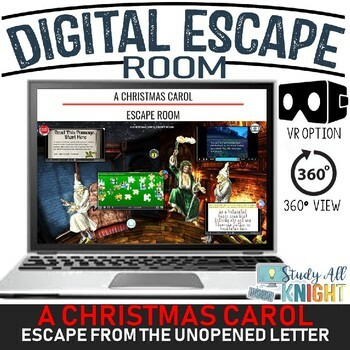 A Christmas Carol Digital Escape Room is an innovative breakout game that allows teachers and students to engage in escape room fun, enjoy the 360° view, and have the VR option. Your students will feel like they are actually in Ebenezer Scrooge's house and in his dreams on Christmas Eve! You'll never see this Dickens classic like this anywhere else. You should definitely watch the preview video for this breathtaking cutting-edge classroom experience! The timely and relevant themes of A Christmas Carol are greed, charity, guilt, kindness, generosity, and goodwill. Your students will love this Christmas activity -great story for the winter holidays that does not have a focus on religion. The story focuses on one of the most famous dynamic characters, Ebenezer Scrooge. Written by author, Charles Dickens. There are several versions of the story. Appropriate for several grades, due to the appeal, range of vocabulary, and versions available. When my students begin, what will they experience? By clicking on “VIEW 360°” the digital escape room opens. There is a "dragging chains," sound effect that makes the user feel like Jacob Marley's ghost is about to show up! Your students will love the video clip to view, so be sure their volume is on. By hovering over each icon in the escape room, you will see messages appear. Look for the “red start button.” This is where your students will read the scenario and receive their first hint as to where to go next. From there on, the excitement begins! Teacher instructions for sharing digital escape room and explanation of how to use the Virtual Reality option and 360° views. **360 views work on a Chromebook by navigating with the "touch pad." On a phone / tablet you would move the device around to see it move. VR option only works on a phone/tablet. There are no forced copies with this digital escape room. Just share the link. Clues involved: Jigsaw puzzle, reading comprehension, Charles Dickens, Google Earth finding a landmark, deciphering a code, order of events (plot diagram) hidden message, and a point-of-view video clip. Designed for small groups / cooperative learning / collaborative learning. link to the story in public domain. A certificate for your students saying, "I ESCAPED THE UNOPENED LETTER!" Complete answer keys for everything and where to find the answers. 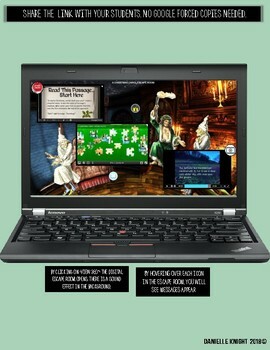 This digital escape room can work with abridged versions of A Christmas Carol, as well as the play, the musical, film adaptations, and many textbook versions. 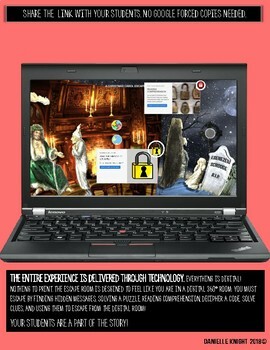 What are your key questions for experiencing classroom digital escape rooms this school year? Are you planning on using one with your students? Here we have the key questions and answers for having a successful experience using a digital escape room. Q: Do my students need Google Accounts to complete a digital escape room? A: If you have a digital escape room from Danielle Knight, then, no. I do not require a forced copy or anyone to log into a Google Account. All of my digital escape rooms are simply, “share the Google Site link,” and go. Teachers: PLEASE CHECK YOUR DISTRICT'S FILTER. You will need access to Google Sites, JigsawPlanet.com, ScreenCastOMatic video server, Google Forms, Google Slides, and Google Earth. I cannot fix any issues for you. Before purchasing, please check to ensure you will be able to use these sites. ALL firewall issues that occur are on your end in your school/district restrictions. It is your responsibility to ensure the links will work prior to your purchase. -Feedback left for tech issues are solely on the buyer's merit and do not reflect the function of the classroom escape room. This breakout game was tested extensively on a PC laptop, PC desktop, Chromebook, Mac, smart phone, iPad, and LINUX.